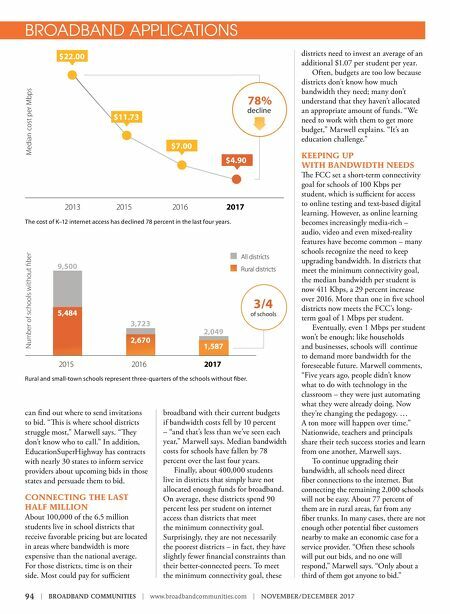 NOVEMBER/DECEMBER 2017 | www.broadbandcommunities.com | BROADBAND COMMUNITIES | 95 As mentioned above, schools can, in theory, use E-Rate funds to build their own fiber connections. However, in addition to the difficulty of getting such requests approved, few rural schools have the resources to pay for their share of such connections. us, getting fiber to 100 percent of schools remains an elusive goal. DEPLOYING WI-FI One of the FCC's most important E-Rate initiatives was to help schools outfit their classrooms with Wi-Fi. Eighty-eight percent of schools now have Wi-Fi in every classroom. Deploying Wi-Fi in the last 12 percent of schools is in some ways easier than getting fiber to the last 3 percent. ere is still funding to cover Wi-Fi, and many of the remaining schools have some Wi-Fi and plan to install more as it's needed or as they can budget the funds for their own share. In addition, a few states have programs to pay some of the matching funds. In some cases, Marwell says, schools either don't know they're eligible for Wi-Fi funding – which for many years was restricted to only a few of the poorest districts – or don't have the technical expertise to specify the right equipment. EducationSuperHighway is helping districts with both these educational missions. ADDRESSING ACTION ITEMS EducationSuperHighway recommends a wide range of action items for all parties interested in making sure students can access digital learning resources. A few items are most critical. • State governments should set up fiber matching funds if they haven't done so already. "Nothing will be more impactful," Marwell says. • Service providers should take advantage of E-Rate to build out their networks, especially where they have no fiber today. 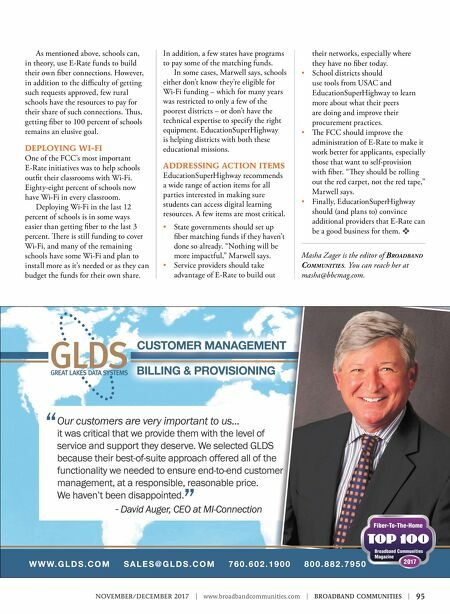 • School districts should use tools from USAC and EducationSuperHighway to learn more about what their peers are doing and improve their procurement practices. • e FCC should improve the administration of E-Rate to make it work better for applicants, especially those that want to self-provision with fiber. "ey should be rolling out the red carpet, not the red tape," Marwell says. • Finally, EducationSuperHighway should (and plans to) convince additional providers that E-Rate can be a good business for them. v Masha Zager is the editor of Broad B and Communities . You can reach her at masha@bbcmag.com.